So good you’ll go blind! Photo courtesy of Mish Haddad. Found at a convenience store in Fukui, Japan. Until then, please visit our websight. 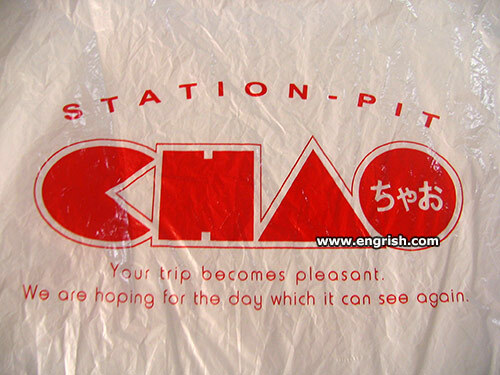 Your pleasant trip will become sensational. I observe, buying this shirt gives you 5 Pts. On your visa card I assume. May I just do it, until I need glasses? Last time I enjoyed Ms Ciao, it took me a week to get my eyes uncrossed. Where is the eye of the day? No day which it can see again, I assure you. CHAO – Chafing His Arse Off.